I. Five friends P, Q, R, S and T traveled to five different cities of Chennai, Kolkata, Delhi, Bangalore and Hyderabad by five different modes of transport of Bus, Train, Aeroplane, Car and Boat from Mumbai. Q1. Which of the following combinations of person and mode is not correct? Q2. Which of the following combinations is true for S? Q3. 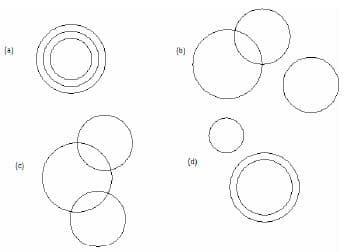 Which of the following combinations of place and mode is not correct? Q4. The person traveling to Delhi went by which of the following modes? Q5. Who among the following traveled to Delhi? There are six persons A, B, C, D, E and F in a school. Each of the teaches two subjects, one compulsory subject and the other optional subject. D’s optional subject was History while three others have it as compulsory subject. E and F have Physics as one of their subjects. F’s compulsory subject is Mathematics which is an optional subject of both C and E. History and English are A’s subjects but in terms of compulsory and optional subjects, they are just reverse of those of D’s. Chemistry is an optional subject of only one of them. The only female teacher in the school has English as her compulsory subject. Q6. What is C’s compulsory subject? Q7. Who is a female member in the group? Q8. Which of the following has same compulsory and optional subjects as those of F’s? Q9. Disregarding which is the compulsory and which is the optional subject, who has the same two subject combinations as F? Q10. Which of the following groups has History as the compulsory subject? Q11. Eight books are kept one over the other. Counting from the top the second fifth and sixth books are on Plays. Two books on Plays are between two books on Composition. One book of Plays is between two books on Poetry while the book at the top of the book of Literature is a book of Composition. Which book is fourth from the top? I. A, B, C, D, E, F and G are sitting on a wall and all of them are facing east. II. C is on the immediate right of D.
III. B is at an extreme end and has E as his neighbour. IV. G is between E and F.
V. D is sitting third from the south end. Q12. Who is sitting to the right of E? Q13. Which of the following pairs of people are sitting at the extreme ends? Q14. Name of person who should change places with C such that he gets the third place from the north end. Q15. Immediately between which of the following pairs of people is D sitting? Q16. Which of the conditions I to V given above is not required to find out the place in which A is sitting? I. Six friends P, Q, R, S, T and U are members of a club and play a different game of Football, Cricket, Tennis, Basketball, Badminton and Volleyball. II. T who is taller than P and S plays Tennis. III. The tallest among them plays Basketball. IV. The shortest among them plays Volleyball. V. Q and S neither play Volleyball nor Basketball. VII. T is between Q who plays Football and P in order of height. Q17. Who among them is taller than R but shorter than P? Q18. Who will be at the third place if they are arranged in the descending order of their height? Q19. Which of the following statements is not true? Q20. Who among them plays Basketball? Q21. What does S play? The Director of the Institute has announced that six guest lectures on different areas like Leadership, Decision Making, Quality Circles, Motivation, Assessment Centre and Group Discussion, are to be organized only one on each day from Monday to Sunday. I. Motivation should be organized immediately after Assessment Centre. II. Quality Circle should be organized on Wednesday and should not be followed by Group Discussion. III. Decision Making should be organized on Friday and there should be a gap of two days between Leadership and Group Discussion. Q22. Which of the pair of lectures was organised on first and last day? Q23. How many lectures are organized between Motivation and Quality Circle? Q24. Which day will the lecture on Leadership be organized? Q25. On which day there is no lecture? Q26. Which of the following information is not required for the above lecture arrangements? I. P, Q, R, S, T and U are six members of a group of which three are males and three are females. II. There are two engineers, two lawyers, one teacher and one doctor in the group. III. Q, T, P and R are two married couples and no person in this group has the same profession. IV. T, a teacher with blue dress, married a male lawyer with brown dress. V. Colour of the dresses of both the husbands and that of both the wives is the same. VI. Two persons have blue dress, two have brown and the remaining one each has black and green. VII. P is a male engineer whose sister S is also an engineer. Q27. Who is the wife of P? Q28. Which of the following is a group of female members? Q29. Which of the following is a pair of married ladies? Q30. What is the colour of U’s dress? A, B, C, D and E are five towns out of which two are hill stations and the reset are in plain. Two towns, which are in plain, are harbours. Four towns out of five are capitals and two are industrial than 5 lacs. It is 20 lacs of one town and more than 50 lacs of two towns. Two towns are on the same latitudes and other two are on the same longitudes. Latitudes and longitudes of both harbours are different and out of these one is an industrial town. The population of both industrial towns is more than 50 lacs. The longitudes of one hill station and one of the industrial towns are same. The latitudes and longitudes of the other hill station and other harbour are different. One industrial town is neither a hill station nor a harbour. None of the hill stations is an industrial town. The hill station of which longitudes are same as that of a harbour, is a capital. B is a hill station while the longitudes of A and E are same. E is a harbour. The latitudes of D and C are same and the population of D is 20 lacs. Both the harbours are capitals and one of them is an industrial town. Q31. Which of the following two town are those whose population is less than 5 lacs? Q32. Which of the following towns is not a capital? Q33. Which of the following is a harbour, capital and an industrial town? Q34. Which of the following towns have population more than 50 lacs? Q35. Which one of the following towns is a hill station as well as a capital? A, B, C and D are four friends who do not mind exchanging items. A had two chessboards each costing Rs. 500 and a record player. C originally had a cycle and a walkman. Each cricket bat costs Rs. 700. Both D and C got a cricket bat from B. A gave his record player costing Rs. 2,000 to B. C got a camera costing Rs. 1,500 from D. The cycle C ad cost Rs. 1,000 and the walkman costs Rs. 700. B had three cricket bats at the beginning and D had two cameras, total cost of which is Rs. 3,000. A gave one of his chessboards to C and took C’s cycle. C gave his walkman to D.
Q36. Who did not have a cricket bat at the end of exchange of items? Q38. After completion of exchange of items, A had with him an item which no one else had. What is the item? Q39. At the beginning who had the costliest items? Q42. Kailash faces towards north. Turning to his right, he walks 25 metres. He then turns to his left and walks 30 metres. Next, he moves 25 metres to his right. He then turns to his right again and walks 55 metres. Finally, he turns to the right and moves 40 metres. In which direction is he from his starting point? Q43. Johnson left for his office in a car. He drove 15 km towards North and then 10 km towards West. He then turned to the South and covered 5 km. Further, he turned to the East and moved 8 km. Finally, he turned right and drove 10 km. How far and in which direction is he from his starting point? Q44. Which is the most suitable. Venn diagram among the following, which represents interrelationship among Anti-social elements, Pickpockets and Blackmailers? Q45. 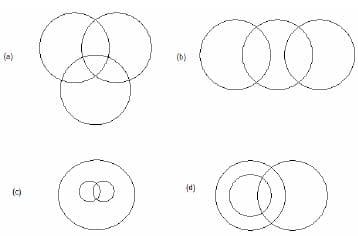 Which one of the following four logical diagrams represents correctly the relationship between Musicians, Instrumentists and Violinists? Directions Q. 46-47 : In each of the following questions, a matrix of certain characters is given. These characters follow a certain is given. These characters follow a certain trend, row-wise or column-wise. Find out this trend and choose the missing character accordingly. (a) Both A and R are individually true, and R is the correct explanation of A. (b) Both A and R are individually true, but R is not the correct explanation of A.
Q48. Assertion (A) : Most of the ancient civilizations grew near the rivers. Reason (R) : The main occupation of man was agriculture. Q49. Assertion (A) : Buddha left home after his marriage. Reason (R) : He wished to be free of all worldly ties and become an ascetic. Q50. Assertion (A) : Food materials should not be soaked in water for a long time. Reason (R) : Washing leads to loss of Vitamin A and Vitamin D from the foodstuff. (a) for all values of n.
(b) only for even values of n.
(c) only for odd values of n.
(d) only for prime values of n.
Q73. Two cyclists start from the same place in opposite directions. One goes towards North at 18 kmph and the other goes towards South at 20 kmph. What time will they take to be 47.5 km apart? Q77. The length of a rectangular room is 4 metres. If it can be portioned into two equal square rooms, what is the length of each partition in metres? Q78. In a group of 52 persons, 16 drink tea but not coffee and 33 drink tea. How many drink coffee but not tea? Q84. 1 – 1/3 + 1/32 – 1/33 + … ∞ = ? Q94. A mixture of 40 litres of milk and water contains 10% water. How much water should be added to it so that water may be 20% in the new mixture? Directions Q. 101-105 : Each question consists of a sentence that has two blanks; each blank indicates that something has been omitted. Beneath each sentence is four sets of words, labeled (a) through (d) . Choose the set of words that when inserted in the sentence, best fits the meaning of the sentence as a whole. Q101. An essential purpose of the criminal justice system is to enable purgation to take place; that is, to provide a ………. by which a community expresses its collective …………. the transgression of the criminal. Q102. Unable to ……….. his wholehearted distaste for media events and publicity, the miffed minister continued to make …….. comments throughout his speech. Q103. The policeman conducted the interrogation not only with dispatch but with ……, being a person who is …….. in manner yet subtle in discrimination. Q105. It is only to the vain that all is vanity; and all is …….. only to those who have never been ………. themselves. Directions Q. 106 – 115 : In each of the following questions, a related pair of words is linked by a colon, followed by four pair of words. Choose the pair, which is most like the relationship expressed in the original pair in capital letters. Directions Q. 116-119 : Each question has four pairs of words in a set. A set may consist of synonyms or antonyms. Q121. Which is the set of correct spellings? Q122. Which is the set of correct spellings? Q123. Which is the set of correct spellings? Q124. Which is the set of correct spellings? Q127. Which group of words have a pair that does not go with other pairs in the same group? Directions Q. 128 – 135 : Read Passage I and answer the questions given at the end of the passage. The answers should be based either on the author’s views or inferences drawn from the given passage. Goerge Bush has the dubious distinction of presiding over the largest negative budget swing in American history : from a surplus of $236 billion in 2000, the year he was elected, to a deficit of $412 billion, or 3.6% of GDP, when he stood again in 2004. Even in an economy with output of around $12 trillion, $648 billion is a lot of money to misplace. Analysts were aghast when the Bush administration’s Office of Management and Budget (OMB) projected that the fiscal year to September 2005 would bring bigger deficits still : $427 billion, according to numbers released in February. The more cynical observers suggested that the administration was simply releasing a ngargantuan number for the pleasure of later telling voters that the budget deficit was closing faster than expected. In support of their argument, figures released by the Congressional Budget Office’ (CBO) in March projected a deficit of only $365 billion. When the OMB revised its numbers sharply downward in July, to $333 billion, the doubting Thomas’ seemed to have a good case. Now however, the CBO, which is generally seen as more level headed, has followed suit. In its Budget and Economic Outlook, released on Monday August 15th, the CBO’s projections moved roughly into line with the administration’s forecasting a shortfall of $331 billion, or roughly 2.7 per cent of GDP. Republicans, unsurprisingly, rushed to claim credit for the improvement, rushed to claim credit for the improvement. Tom DeLay, the majority leader of the House of Representatives, said that the brighter budget picture “should come as no surprise” to anyone familiar with the Republican platform of cutting taxes to spur economic growth. Many voters are also prepared to give Mr. Bush the benefit of the doubt. The economy, after all, seems to be chugging along nicely. Real GDP grew at a solid 3.4 per cent in the second quarter of 2005, an annual rate envied by most European countries. Even America’s budget deficit doesn’t look so bad when compared with the likes of Italy and Germany. Democrats, of course, pooh-pooed the notion that a mere third of a trillion dollars-worth of new debt was anything to smile about. More significantly, Douglas Holtz-Eakin, the CBO’s director, gave a warning that the improvement, while welcome, seemed to be largely temporary. The CBO’s report attributes most of the decrease to an unexpected surge in corporate income tax receipts, thanks to double-digit growth in corporate profits since the end of the 2001 slowdown. But the boom in profits cannot be sustained over the long term, especially since much of the increase seems to stem from short-lived changes to the tax code. Further out into the forecast period, the CBO says its outlook is largely unchanged. The deficit will shrink slowly until 2010, then drop sharply as Mr. Bush’s tax cuts expire. Federal debt will tick slightly upward, reaching almost 40 per cent of GDP by 2010, and then begin declining as the expiring tax cuts push the budget towards balance. All of this is, of course, more art than science. The CBO itself notes that even if there are no legislative changes in levels of taxation or spending, the vagaries of economic forecasting mean that there is a 25 per cent change that the budget will be in balance, or show a surplus, in 2010- and a 10 per cent chance that year will see a budget deficit greater than 5.9 per cent of GDP. And many of the assumptions that the CBO makes, or is forced to make, seem rather far-fetched. It assumes that discretionary spending grows only at the rate of inflation, for instance, even though in the recent years this category has grown at multiples of the inflation rate. It is also required to proceed as if all of Mr. Bush’s tax cuts were destined to expire on schedule, when in fact there is considerable interest in making them permanent. But there’s one prediction it is making with a high degree of confidence: Social Security and Medicare, America’s old-age programmes, will eat up an increasing share of federal spending and thus spell big trouble for the budget. The first “baby boomers” will be eligible for early retirement in 2008. The strain of caring for the swelling ranks of America’s aged will begin to tell then, and it will get steadily worse throughout the remainder of the forecast period, which ends in 2015. The CBO thinks that Social Security, Medicare and Medicaid, Amercia’s health-care programme for the poor, will together account for more than half of federal spending by 2016. The CBO’s forecasting period does not stretch far enough to cover the biggest shocks to come. It is not until 2017 that Social Security’s outflows the government to tap general tax revenues to pay benefits. Excess Social Security contributions have been masking a large portion of the budget deficit for years; without those “off-budget” surpluses, Bill Clinton would have struggled to close the deficit in his last twoyears in office, and last year’s shortfall would have been well over half a trillion dollars. Mr. Bush, of course, would argue that this is precisely why the country needs his proposed (and floundering) reform of Social Security. His opponents retort that it calls for a thorough repeal of his changes to the tax code. With 2017 comfortably distant-sounding, neither seems particularly likely. Instead, Amercia’s government is brining back the 30-year bond, which it retired in 2001 when surpluses seemed to stretch-out as far as the eye could see. As they run up the national charge account, legislators can be least take comfort that the latest round of downward revisions to forecasts seems to cast further doubt on the “twin-deficit hypothesis”, which argues that Mr. Bush’s spendthrift ways are driving up the current-account deficit and putting the country in danger of a catastrophic revaluation of the dollar. Trade deficits have continued to soar even as budget deficits have come down, which tends to support a theory advanced by Ben Bernanke, the chairman of Mr. Bush’s Council of Economic Advisers. He has suggested that a global savings glut is flooding America with cheap money, and that the government deficits may in large part have been moping up surplus capital that would otherwise have been borrowed by America’s already debt-ridden consumers. But even Mr. Bernanke has stressed that deficit-reduction should still be a priority. “Not catastrophic” seems a poor guideline for fiscal policy, government or personal. For now, however, it appears to suit America’s politicians and consumers just fine. (a) Tom DeLay was surprised by the improvement in the American Economy. (b) Republicans did not claim credit for improvement in the economy. (c) Many voters were prepared to give credit to Mr. Bush for the improvement in the American economy. Q129. Which of the following is not a true statement? (a) Office of Management and Budget did not change the budget projections. (b) Congressional Budget Office revised the budget numbers downwards. (c) Projections made by Congressional Budget Office were similar to those of OMB. Q130. Which of the following is a correct statement? (a) George Bush was the first American President ever during whose tenure there was a deficit projections. Q131. Which of the following is a correct statement? (a) There is some possibility that the budget will be in balance by 2010. (b) There is absolutely no possibility that the budget will be in balance by 2010. (c) There is 50 per cent possibility that the budget will be in balance by 2010. (d) It is certain that the budget will show surplus by 2010. (a) USA needs urgent reforms of social security. (b) USA does not need any urgent reforms of social security. (c) Bill Clinton was responsible for the sagging federal resources. Q134. According to the passage. (a) It is not at all likely that social security and Medicare will consume a great deal of federal funds. (b) It is certain that social security and Medicare will consume a great deal of federal funds. (c) There is some chance that social security and Medicare will consume a great deal of federal funds. Q135. Which of the following is not a true statement? (a) By 2008 the aged population of USA will bean to become a major burden on the budget. (b) By 2008 the burden of caring for the aged population of ISA will gradually decline. (c) By 2015 the burden of caring for the aged population of USA will peak. (d) By 2015, social security, medicare and health-care for the poor will account for a major part of federal spending. Directions Q. 136 – 142: Read passage 2 and answer the questions given at the end of the passage. The answers should be based either on the author’s views or on inferences drawn from the given passage. India’s success in the outsourcing business has raised a lot of interest among politicians, business people and trade unions. However, the picture concerning India’s economic potential and impact on the global economy is confusing, as people tend to overemphasise either possibilities or threats related to services outsourcing. The rise in offshore outsourcing of various services is mainly due to technological developments that enable efficient transfer of data and information over long distances. India’s success in the field is explained by several additional factors. Firstly, India has a large pool of skilled, English-speaking and relatively-low-cost labour. Secondly, contrary to most other sectors in the country, the IT/BPO industry has enjoyed a liberal regulatory environment that has promoted competition and inflow of Foreign Direct Investment (FDI). Moreover, India’s geographical location allows it to exploit time zone differences, which is a significant advantage in certain back-office activities. Large-scale offshore outsourcing of software and business services is a relatively new phenomenon, as only in 1996 did India’s exports of IT/BPO services exceed the USD 1 billion mark. However, since then growth in the sector has been impressive, and in 2003 exports exceeded USD 12 billion. The software and business process outsourcing industry already accounts for about 40 per cent of total services exports from India. Moreover, compared to China, where local enterprises in this, sector are still relatively small, in India the largest domestic companies (Tata, Infosys, Wipro) have already expanded their activities into other countries-including China. Thus the biggest Indian companies are already true global players. The prospects of the Indian software and business process services sector are promising, although the market is continuously changing and new competitions are emerging in Asia and elsewhere. However, while the offshore outsourcing of IT/BPO work will remain an important issue at enterprise level everywhere, the macroeconomic impacts of this industry on the Indian economy or at the global level are perhaps smaller than one would expect given the media coverage of the issue. According to the India IT industry association NASSCOM, the IT/BPO sector in India employs less than one million people, which is negligible number compared to the total workforce. Total sales of the IT/BPO industry in relation to GDP have increased during the last half decade from about 1 per cent to close to 4 per cent, and hence the share of value added (i.e., the GDP share) produced by the sector must be even less. The IT/BPO sector may have important spill over effects on other sectors of the economy, and it certainly serves as a good example of pro-market reforms. However, factors other than services exports will continue the overall economic development of India in the coming years. In similar vein, the development of the Indian service industry is likely to be a smaller threat to the industrial countries than one would expect from the media coverage. The US accounts for about 70- 80 per cent (about USD 9 billion) of India’s exports of IT/BPO services. However, while this is some 6-7 per cent of total US imports of ‘business services’, imports from Indian are unlikely to pose a major threat to the US economy and employment. In the Euro area, India’s role in evidently much smaller than in the US. In fact, there are good reasons to believe that outsourcing is not a zero sum game, but brings more benefits than costs to all participants, as suggested by the basic theory of international trade. From this perspective it is possible that the Euro area countries have suffered in relative terms from the uneven competitive situation created by offshore outsourcing developments since the mid-1990s. Thus, for example, compared to enterprises in the US and the UK, enterprises in the Euro area-largely due to their exotic language demands have found it more difficult to cut their costs through offshore outsourcing. As regards the US and the UK, there is not evidence that they have lost their share of the global market for services. In fact, they both seem to have significantly increase their market share in the ‘business services’ category. Given their good external competitiveness, it is perhaps difficult to argue that countries like India could be a major threat to their domestic markets either. As regards the Euro area, the situation seems to be somewhat different, as Germany has managed to retain its market share, while France and Italy lost ground particularly during the 1990s. thus, although serious problems related to statistics on services trading make any conclusions very tentative, there seems to be some indication that at least some Euro area countries have not been able to make use of the new business opportunities brought about by recent advances in IT technology. Investment flows into India illustrate well the consequences of the country’s inward-looking policies. Due to strict regulations effectively limiting foreign ownership, direct and portfolio investment in the Indian economy has been very limited. The major exceptions in this respect seem to be some services (business services, telecommunications, and hotels and restaurants) and the car industry, which have gradually been liberalized and opened up for foreign companies. Due to enhanced competition, imported capital and know-how, the growth performance of these sectors has been impressive. The prominent role by the fact that multinational companies account for almost half of India’s exports of business process outsourcing services, although domestic enterprises dominate software exports. In a similar manner, due to stiff competition brought about by a dozen foreign care manufacturers, India’s car industry in today one of the most dynamic in the world. Contrary to India, the Chinese economy has been open to foreign direct investment, which has had a major impact on China’s economic growth since the early 1990s. Today, multinational companies, account for about half of country’s exports. However, as a consequence of very strict requirements concerning the participation of foreigners in equity trading and the fact that the state still holds majority stakes in nearly all listed companies, the role of portfolio investment remains negligible in China as well. In order to summarie the diverse development in India and China during recent decades, per capita figures on trade and FDI offer a complementary view of the involvement of these countries in the global economy. China’s stronger overall economic performance is associated with rapidly increasing per capita trade and significant FDI inflows. In India, for its part, it is still difficult to identify any significant changes in these respects. (a) Outsourcing is not at all beneficial to all participants. (b) Outsourcing is beneficial to all participants. (c) Outsourcing is beneficial to a few but harmful to most participants. (d) Outsourcing is beneficial to most, though may be harmful to a few. (a) India’s policies have brought in limitless foreign direct investment. (b) India’s policies have limited the flow of foreign direct investment. (c) Telecommunications, hotels and the passenger car industry have not received much foreign direct investment. (d) Telecommunication, hotels and the passenger car industry have not had an impressive growth in recent years. Q138. Which of the following is a true statement? (a) Foreign direct investment has had limited impact on China’s economic growth. (b) Share of MNC’s in China’s exports is not very large. (c) Stringent regulations are applied to foreigners participating in equity trading in China. (d) Portfolio investment is large in China. (a) The trend in offshore outsourcing of services is increasing. (b) The tread in offshore outsourcing of services is not increasing. (c) The outsourcing of services has nothing much to do with technological advancements. Q140. Which of the following is a true statement? (a) Till 1996 India’s exports of IT/BPO services were much above USD 1 billion. (b) Only by 1996 India’s exports of IT/BPO services exceeded USD 1 billion. (c) Since 1996 India’s exports of IT/BPO services has not had much growth. (d) In 1996 India’s exports to IT/BPO services exceeded USD 12 billion. (a) IT/BPO sector in India employs a significantly large percentage of work forces. (b) IT/BPO sector in India employs a significantly small percentage of work forces. (c) During the past few years IT/BPO sector in India have contributed a great deal of value added to GDP. (d) IT/BPO sector has had very little or no impact on the economy. Q142. Which of the following is not a true statement? (a) The media has exaggerated the threat of Indian services industry to the developed countries. (b) The major part of IT/BPO services of India goes to the USA. (c) The US accounts for less than 10 per cent of India’s exports of IT/BPO services. (d) BPO/IT imports from India is not a major threat to the US economy and employment. Directions Q. 143 – 146 : Read passage 3 and answer the questions given at the end of the passage. The answer should be based either on the author’s views or inferences drawn from the given passage. The music business has long wailed that Internet piracy is destroying its business. Now, it is fighting back on two fronts-first, by driving illegal operators out of business; then by driving as hard a bargain as possible with those firms selling legal downloads. Indeed talks between Microsoft and the major music firms have just broken down because the software company thinks the music business is demanding unreasonable levels of royalties. Things are going better for the major record labels on other fronts. Last week the founder of a popular “peer-to-peer” (P2P) file-sharing program, Sam Yagan, told a Senate committee that his company would soon stop operating in its current form. He explained the Donkey – which accounts for around half of all P2P traffic-can no longer afford to fight the music industry in the wake of the Supreme Court’s ruling in June against two other P2P firms, Grokster and Stream Cast, which declared that such applications are illegal if they induce users to violate copyright. As expected, the music industry is now using its legal victory to hound commercial P2P operators out of business. Last month the music industry’s trade body rent them threatening letters. WinMix, another P2P network, appears to have shut down, while eDonkey says it plans to start making its users pay for music. Grokster is reportedly on the verge of selling itself to a company called Mashboxx, which has a similar strategy to go legitimate. In Australia last month, a court ruled against Kazaa, another popular filesharing service, and ordered it to use filters to stop the trading of copyrighted content. Nobody, however, including executing at the major labels, believes that file sharing is defeated. When the industry forced Napster, the first big filesharing network, to shut down in 2001-it has since relaunched as a fee-bases service – a host of free alternatives sprang up immediately, and that is what will now happen again. Because of the Supreme Court’s ruling, says Mr. Yagan, the new P2P services will simply move offshore and underground, and will offer more anonymity. In fact, the Supreme Court’s decision is likely to encourage a move towards free, “open-source” P2P applications. Since they do not make money from advertising or bundling software, they are less vulnerable to the accusation that they are illegally inducing piracy for their own benefit. In the first half of 2005, digital-music sales from mobile-phone “ring-tunes” and legal download services such as Apple’s iTunes more than tripled compared with last year, and how represent 6 per cent of total music revenues, according to industry estimates released this week. That rapid growth has restored confidence to the music industry, as have its victories in court. So much confidence, indeed, that some of the major labels are urging apple’s iTunes service-the epitome of success in online music sales so far – to shift to variable (i.e., higher) prices from the consistent $0.99 per track it currently charges in America. That would be a mistake. Despite its rapid growth, the legal market for music on the Internet is still in its infancy. Apple’s boss, Steve Jobs, believes that higher prices would stifle legal sales and encourage P2P-based piracy. Microsoft might even deserve better treatment, too. Since the major labels’ legal stick will never be completely effective against P2P, it is vital that they also offer an attractive carrot. Q143. Which of the following is a true statement? (a) Everybody knows that file sharing is a thing tae past. (b) Nobody thinks that file sharing will survive. (c) Some people think that file sharing is a thing of the past. (d) Nobody thinks that file sharing is a thong of the past. Q144. Which of the following was the first big file-sharing network? (a) Illegal operators are fighting against music business. (b) Music business is fighting to get a good deal from legal downloads. (c) Music business has destroyed Internet piracy. (d) Major music firms are engaged in fruitful talks with Microsoft. (a) Apple’s iTunes are legal downloads. (b) Apple’s iTunes are not legal down loads. (c) Apple’s iTunes should increase its current prices. (d) Music on the Internet has had a very slow growth. Directions Q. 147 – 162 : Read Passage 4 and answer the questions given at the end of the passage. At its south-east corner, America peters out into ‘something that is neither land nor sea, but a subtropical swamp in between. The Indians who hid in this inaccessible place called it the Pa-hay- Okee, the grassy river. “The blowing gray-gold flow of saw grass in the glittering fresh (glades),” wrote Peter Mathiessen, a naturalist and novelist, “stretched away forever, north and south, to the mysterious dark hammock isles on the horizon.” This is the Everglades, a place once so rich in wildlife that America’s greatest bird painter, John James Audubon, described the sum blotted out for minutes at a time by the great flocks of herons and egrets flying past. Now, the Everglades is the site of America’s largest civil-engineering project and the world’s most expensive environmental clean-up. But this, too, is in danger of petering out into a swamp-one made up of conflicting interests, state ambition and federal indifference. Restoring the Everglades mattress for its own sake. But it also matters because, after Hurricane Katrina, the balance, between protecting people from nature, and protecting nature from people, has become an urgent matter of public policy – and this is the place where that policy has been most exhaustively thrashed out. As in New Orleans, the Everglades saw a disastrous flood (in 1928) when a levee broke and thousands died. As in the Everglades, the Louisiana bayou could not absorb the storm surge in part because its natural environmental had been degraded by flood-control measures and housing and could no longer act like a sponge. The Everglades project is a test of whether it is possible to restore a whole ecosystem, while still allowing cities to keep on growing nearby. If it succeeds, it will be a model for schemes throughout the Americas, including the Gulf coast. If it fails, environmental clean-ups will no doubt continue, says Colonel Robert Carpenter, the man in charge of restoration, but they will be too small to do much more than slow the rate of decline. The whole of south Florida was once one enormous hydrological system, stretching from Orlando to Key West. Abundant rainfall was channeled down the winding Kissimmee river into Lake Okeechobee. From there, water lapped over the southern edge and spread south in a vast curve, moving 100 feet (30 metres) a day, in a sheet flow inches deep but 50 miles (80 km) wide. Stands of saw grass thrived in an imperceptibly undulating landscape of ridge and sloughs, interspersed by teardrop-shaped islands of trees in a pattern that flowed the current. A teeming would depended on the tiny changes of elevation. Snails lay their eggs near the base of the grass stems – too high and the grass topples over from the weight, too low and rising water drowns the eggs. The snail kite feeds on this species, its beak curving precisely into the snail’s whorl. Fish ripple out as the water rises and congregate as it falls, providing food for wading birds such as the word stork. But in the 1930s, the Army Corps of Engineers (at the behest of the federal and state governments) built a new levee around Lake Okeechobee to dam the southward flood. In the 1940s, it drained the area to the south to create vast sugar fields. In the 1950s, the crops diverted the river, allowing Miami and Fort Lauderdale to grow on the old riverbed. In the 1960s, the corps crisscrossed the remnants of the grassy river with dykes, ditches and levees. The river is now in the wrong place and more akin to a series of ponds. These ponds (called water conservation areas) still have sloping, not flat, bottoms, so the water tilts south, flooding the ponds’ southern parts, while leaving the northern bits dry. At the bottom or each pond, the tree islands drown; at the top, they burn; fire and flood at once. Around 60 per cent of the tree islands have been lost; so has the old landscape of ridges and sloughs. With it have gone the tiny wildlife depended. About half the old Everglades has been taken for cities or farms. If all the rain that falls on southern Florida were channeled into the remaining half, there would be floods. So, 1.7 billion gallons a day is pumped from Lake Okeechobee east and west to the Atlantic Ocean and the Gulf of Mexico (where the fresh water duly wrecks the marine environment). And because less water reaches the south of the Everglades National Park, the sea and mangrove swamps are advancing inlands at the rate of 12 feet a year. The old sheet flow has stopped. So the water that remains has to be pumped around in ways that change water levels more abruptly than the vegetation can respond to. Plants that depend on a subtle ebb and flow are drying. The great flocks of waders are gone. Invasive species are appearing, including tropical fish and pythons, which have spectacular fights with the alligators. Underlying everything, argues Tom van Lent, a hydrologist, is a change in the food chain itself. Once it was “primary”; fish ate a mixture of algae and bacteria. Now it is “detrital” : cattails spread everywhere, rotting in the water, and fish feed on the detritus. When something that basic changes, so does everything else. “The ecological system is in a state of near-total collapse,” claims John Marshall, a green activist. Enter the Comprehensive Everglades Restoration Plan (CERP), which was signed in Dec. 2000, at the last gasp of the Clinton administration. It was expensive ($ 7.8 billion then, at least $10 billion now), extremely complicated (with 68 projects planned over 30 years) and it demanded a new sort of partnership between state and federal governments, with each side paying half. But it was also popular it passed by 85-1 in the Senate and it won the support of virtually everyone : greens and property developers, Republicans and Democrats, sugar farmers and fishermen. Five years later, not a single CERP project has been built. Costs are rising. The coalition has fractured. And the state-federal partnership is not working. In March, Gary Hardesty, CERP’s project manager in Washington, wrote in an internal memo “We have missed almost every milestone. It is different from what we told Congress we would do, and it’s not restoration.” The main restoration idea was simple. More water would be reintroduced into the ecosystem and allowed to flow southwards as it used to. But since CERP could not risk floods, the project was also to improve flood control and water supply in Florida’s southern cities. Everglades restoration was never going to be that simple. Ideally, as much water as possible would be introduced at the top of the system, just below the agricultural area. But that is impossible. The old river of grass flowed in a southwesterly are, which meant the water flowed slightly faster on the longer, eastern side. This moving wall of water acted as a natural dam : water restraining water. But when the corps moved the river sideways, it destroyed the watery dam. To let nature take its course would have risked flooding Miami and Fort Lauderdale. So, instead, CERP is aiming to restart about four-fifths of the old current in the lower half of the system. Water from Lake Okeechobee will be pumped through the upper and middle reaches of the glades in a complicated zigzag, before being piped back into the lower Everglades. Since this would do nothing to improve the flow in the middle reaches, the plan also calls for removing some of the main dams and canals there. The corps will, for example, punch holes through the L67 canal that cuts across the river and arise parts of the Tamiami Trail, an east-west road just above the national park. To stop all this “extra” water flooding the system, it has controversial plans to store it above and below ground (more on that in a moment). The project, in other words, is an attempt to manage the environment back to health. As Bob Johnson, the chief scientist of Everglades National Park, put it, “it is not a restoration plan as such. It is really an integrated watershed management plan.” That is why it is complicated and costly. Environmentalists fear a managerial approach is not going to work : the ecosystem is too badly damaged. Much of the system would benefit, of course, but Mr. Johnson points out that restoring four-fifths of the old current might not be enough to save the deeply polluted southern estuaries. So even if it were implemented, CERP would not answer all the problems. (a) The Kissimmee river is now more like a cluster of ponds. (b) The ponds do not have sloping bottoms any more. (c) The ponds do not cause flooding any more. Q148. Which of the following is not a true statement? (a) The Army of Corps of Engineers built a new embankment around Lake Okeechobee. (b) The Army of Corps of Engineers created vast sugar fields. (c) The Army of Corps of Engineers diverted the river. (d) The sugarcane crisscrossed the grassy river. (a) The base of grass stems were too low. (b) The grass topples due to the weight of the eggs laid by snails. (c) The snails lay eggs in the rising water. (d) The snails, lay eggs at the elevation. Q151. Which of the following is a true statement? (a) Everglades project is an experiment to understand the weather conditions. (b) Everglades project has proved that the original ecosystem can be restored back while allowing cities to grow. (c) Everglades project has proved that the original ecosystem cannot be restored back while allowing cities to grow. (d) Everglades project explores to understand if the ecosystem may be restored while allowing the cities to grow. (a) Protecting people from nature is less important than protecting nature from people. (b) Protecting nature from people is not important. (c) Protecting people from nature is very important. (d) Protecting people from nature is more important than protecting nature from people. Q153. Which of the following is not a true statement? (a) Peter Matthiessen was a naturalist and a novelist. (b) John James Audubon was not a naturalist. (c) Peter Matthiessen was bird painter. (d) John James Audulon was a bird painter. (a) The snail kite feeds on fish. (b) The snail kite feeds on birds. (c) The wood stork feeds on the fish. (d) The wood stork feeds on the snails. Q155. Which is the following is not a true statement? (a) Kissimmee river was once a big hydrological system. (b) South Florida experienced abundant rainfall. (c) Okeechobee is a winding river. (d) From Okeechobee water moved in great height and width. (a) Not much damage has taken place to the tree islands. (b) Not much damage has taken place to the old landscape of ridges and sloughs. (c) Not much damage has taken place to the wildlife. (d) Major damage has taken place to the old landscape of ridges and sloughs. Q157. Which of the following is a true statement? (a) If all the rain that falls on South Florida were channeled into Everglades, floods would be avoided. (b) Not much water is pumped from Lake Okeechobee to the Atlantic Ocean and the Gulf of Mexico. (c) The fresh water destroys the marine environment of the Atlantic Ocean and the Gulf of Mexico. (a) The vegetation of the Everglades National Park has not been affected adversely. (b) The vegetation of the Everglades National Park has been affected adversely. (c) Tropical fish and pythons fight with alligators. (d) Tropical fish and pythons are aggressive species. Q159. Which of the following is not a true statement? (a) CERP was a very popular document signed during the Clinton administration. (b) CERP was based on the equal partnership between the state and federal governments. (c) CERP project has proved to be a major success so far. (a) Everglades restoration would be a very complex process. (b) Everglades restoration would not be a very complex process. (c) It was not difficult to introduce a great deal of water just below the agricultural area. (d) The water dam was restored by the Army Corps of Engineers. Q161. Which of the following is a true statement? (a) Water from Lake Okeechobee will not be pumped through the upper reaches of the glades. (b) Water from Lake Okeechobee will be pumped through the upper reaches of the glades. (c) Water from Lake Okeechobee will not be pumped through the middle reaches of the glades. Q162. Who is the chief scientist of Everglades National Park? Directions Q. 163 – 175: Read Passage 5 and answer the questions given at the end of the passage. The answers should be based either on the author’s views or inferences’ drawn from the given passage. The systems perspective, applied to organisations in its classic formulations as an organic or a cybernetic model, is open to criticism for failing to give a sufficient account of change. In the organic model, change is seen primarily as an adaptive response by the system, acting as a whole or through subsystems with specific functions, to maintain itself in balance with a shifting environment. Change is thus externalized beyond the system boundary. The organism’s response is characterized as a negative feedback process by means of which a control centre becomes aware of a disparity between actual and desired behaviour or conditions and triggers actions to reduce the disparity. The model assumes that the organism is so constituted as to be able to detect significant disparities and to be able to adjust its behaviour in response to them. When the organic model is generalized to apply to organisations, the emphasis on boundary, environment, feedback and adaptive response are carried over, and management is readily identified as the control centre, which directs the organisation’s operations. However, organisations do not possess the same unity or consistency of form as organisms. Their external boundaries, as well as internal boundaries between subsystems, are less evident and less fixed. Responses to internal and external pre-set or inbuilt, but have to be invented. Applied uncritically, the model attributes too central a role to management and overestimates management’s power to control events and actions. Direction of operations comes not from an integrated control centre but from a multiplicity of factors whose behaviour is not merely adaptive but also creative and contentious. The cybernetic model provides a more elaborate account of control and communication mechanisms organized hierarchically and recursively and distributed throughout the system. It also includes an environmental scanning function, which opens up the possibility of proactive change in the system. Nevertheless, although change becomes a subtler, complex and generalized phenomenon in this model, changes are still seen as adjustments, whether reactive or proactive, which serve to maintain or increase order in the system. Not is to any easier to relate change to human agency in the cybernetic model than in the organic. In the “soft systems” approach articulated by Checkland, attention shifts from the actual constitution of organisations as complex systems towards organizational actors’ understandings and formulations of problem situations. This is a view which ‘allows and expects multiple interpretations of the world at hand. When soft systems methodology (SSM) is applied to a problem situation in an organization, it culminates in a debate, which aims to define changes, which are “systemically desirable and culturally feasible”. The human role in defining (and subsequently carrying out) changes is thus recognized. The soft systems approach makes change more central to organizational life than it is in the harder approaches sketch above, which focus on the system’s capacity to cope with and respond to environmental perturbations. Change now becomes something, which flows from human understanding and decision-making, which is not in general prefigured or automatic, and which involves negotiation by competing parties. However, some of the legacy of the earlier systems views persists in the soft systems approach and methodology, and serves to prevent fuller appreciation of the nature of change in organizational life. For instance, the central notion of transformation in the methodology relates still to the transformation of inputs into outputs by the system, rather than to transformation of the system itself. Analysis and modeling in SSM, by and large, is conducted by the analyst alone, so that some of the most important interpretations in the change exercise are supplied by external experts. When the conceptual model is brought forward by the analyst for organizational debate, the voice of management is likely to be dominant, again restricting opportunity for a more thoroughgoing review of possibilities. Thus, even though the soft systems approach beings change to the centre of the organizational stage by focusing on human activity systems and embracing the interpretive standpoint, change is still characterized as a discontinuous step from an old order to a new one, facilitated by the alchemy of the analyst, and sanctioned by management. In the systems tradition as discussed so far, there is a common interest in how complex systems achieve, maintain and increase order, in a turbulent environment, which threatens to invade environment, which threatens to invade or dissolve them. In the organic model, change is essentially an external threat to be responded to Richer notions of change are developed in the cybernetic and soft systems approaches, but still, change is seen as a way of preserving or improving order in the system, rather than as a fundamental feature of the system itself. In the translation of systems concepts to organizational models, the identification of control with management has produced an impression that organizational change must be managed, and that managers, in alliance with experts, can and should manage change. It has always been clear that organisations are not organisms, but the limitations of applying the organic metaphor have only become obvious relatively recently, when the pace of organizational and technological change has thrown into question the contemporary validity of organizational models based on central control, stability and bureaucracy. It may be that continuous change is an essential feature of organisations or it may be that disorder is not only tolerable in organisations but also natural and productive. To contemplate these possibilities, it is necessary to go beyond the familiar systems models and at the same time to question ideas of change management. Kiel, following an earlier formulation by Jantsch, describes three stages in the development of models of organizational change. The first stage, deterministic change, is a mechanical or linear view, which equates to a pre-systems or early systems view of organisations as machines subject to rational control. The second stage, equilibrium-based change, is essentially the system perspective, especially as represented by the organic or cybernetic models. The third stage, dissipative or transformational change, views organisations as dynamic self organizing systems capable of radical transformation as well as gradual evolution, and continually moving between order and disorder and between stability and instability. Organizational models in this third stage go beyond (or may be seen the extend) the systems tradition, drawing on theories of chaos, complexity and selforganisation from the natural sciences. New holistic theories of change are emerging which challenge the centrality or order and control in complex systems. According to these theories, many complex systems are non-linear, i.e., systems in which relationships between cause and effect are not constant. Therefore, small inputs can sometimes lead to disproportionately large consequences (and at other times not), and small variations in initial conditions can sometimes produce large variations in outcomes (and sometimes not). Generally, processes cannot be fully controlled or planned, and cannot be run back and repeated. Many natural systems, including ecologies and the weather, are non-linear. They are characterized by complex multiple patterns of interaction which combine with random disturbances to produce unpredicatable systems into an entirely new configuration. In general, as they move from one relatively stable region of behaviour to another, such systems pass through a chaotic transition phase. A system far from equilibrium and at the edge of chaos is one on the point of transformation change, but the future state of the system is not predictable. It seems attractive to adopt a transformational model of organizational change derived from these more general ideas of dynamic non-linear systems. The complexity, uncertainty and centrality of change processes seem much better captured in this kind of model than in earlier systems models. However, it should be remembered that just as organisations are not organisms neither are they weather systems or whirlpools. Organisations are constituted by people, not particles. Change is produced not by the complex interaction of effectively structure less atoms, but by the meaningful and value-laden interaction of already complex individual human beings. Though it may indeed be fruitful to see organisations as non-linear systems, to do so will require a fundamental shift in our understanding of the role and limits of control and likewise of the role and limits of management. It would for instance be fallacious to assume that management can apply the transformational model in order to produce a desirable transformation in their organization, since this would be to treat non-linear systems as though they were linear (and so predictable and controllable). Another danger is that by simply adopting the language of non-linear systems we will produce a spurious jargon and mystification which will lead neither to increased understanding not to a practical action in organiatonal life. The theories of chaos and complexity are seductive and can easily lead into world of butterfly effects, strange attractors and NK fitness landscapes. Nevertheless, a cautious and sober application of them might prove fruitful in our area of interest. (a) Cybernetic model focuses on actors’ understanding and formulations of problem situations. (b) Organic model focuses on actors’ understanding and formulations of problem situations. (c) Soft systems approach focuses on actors’ understanding and formulations of problem situations. (d) Soft systems approach focuses on organisations as complex systems. Q164. Which of the following assumptions may be made from the passage? (a) Processes can be fully planned. (b) Many natural systems are characterised by complex patterns of interaction. (c) People are particles of organistaions. (d) Change is produced by complex interactions of atoms. Q165. According to the passage, which of the following is not a correct statement? (a) In the organic model, change is viewed as an external threat. (b) In the cybernetic model, change is viewed as a way of improving order in the system. (c) In the cybernetic model and in the soft systems approach, change is seen as a fundamental features of the system. (d) In the soft systems approach, change is viewed as a way of improving order in the system. (a) failed to provide a satisfactory account of change. (b) revealed the classic dimension of the organic model. (c) did not respond to negative feedback. (d) refused to look beyond the system. Q167. Which of the following is a correct statement? (a) Deterministic change is the systems perspective. (b) Equilibrium-based change is the systems approach. (c) Equilibrium-based change is a mechanical view. (d) Transformational change is a mechanical view. Q168. Which of the following is not a correct statement? (a) Change is primarily a response to the environment. (b) The system as a whole or the subsystems adapt to the environment. (c) The environment is not stable. (d) Change cannot be externalized beyond the system boundary. (a) does not flow human understanding or decision-making. (d) involves negotiations by competing parties. (a) the organism’s response is negative. (b) a control centre influences behaviour. (c) the organism is able to adjust its behaviour. (d) the organism is not able to detect significant disparities. Q172. Which of the following is not a correct statement? (a) Management is seen as the control centre of organisations. (b) Organic model uses concepts of boundary and adaptive response. (c) The organic model views management as a part of environment. (d) Organisations are not totally comparable to organisms. Q173. Which of the following is not a correct system? (a) Cybernetic model recognizes human role in defining change. (b) Organic model does not recognize human role in defining change. (c) Soft systems approach recognizes human role in defining change. (d) Soft systems approach defines changes, which are systematically feasible. (a) cybernetic model is more realistic. (b) organic model is more realistic. (c) organic model is as realistic as the cybernetic model. (d) cybernetic model is as realistic as the organics model. Q175. Which is the following is a correct statement? (a) Cybernetic model takes better care of environmental factors. (b) Organic model takes better care of environmental factors. (c) Cybernetic model is not suitable for proactive change. (d) Organic model is suitable for proactive change.